Golfers have many wedge options to use around the green. Golfers are faced with a variety of options when they’re within 125 yards of the green. From that distance, most golfers will reach for a wedge. Golfers carry several different wedges that enable them to hit a number of different shots, but understanding the differences in the variety of wedges will help improve your short game and lower your scores. The most common wedge, the pitching wedge, is used for a variety of full shots, pitches and chips. Pitching wedges generally have a loft between 47 and 53 degrees depending on the club manufacturer. The clubfaces on pitching wedges have little bounce, which allows the clubface to slide under the ball, which gets the ball in the air quickly and sets it down softly on the green. Nearly all standard golf club sets come with pitching wedges, though they can also be bought separately. If a golfer hits into a sand trap, he will reach for a sand wedge. The loft on sand wedges falls between 54 and 58 degrees. The clubface also features a large amount of bounce on its rounded bottom, which keeps it from digging into the sand on shots. While the sand wedge can be used in the fairway, the added bounce in the clubface makes bladed shots more likely to occur, but the extra loft on the club will cause the ball to stop more quickly on the greens. The gap wedge has been appearing more frequently in golf bags. The club is generally lofted between 50 and 54 degrees and is meant to bridge the distance gap between a pitching wedge and sand wedge. A gap wedge can be used from the fairway, rough or on chips shots if a bit more loft is needed. Gap wedges are often not sold with standard club sets. 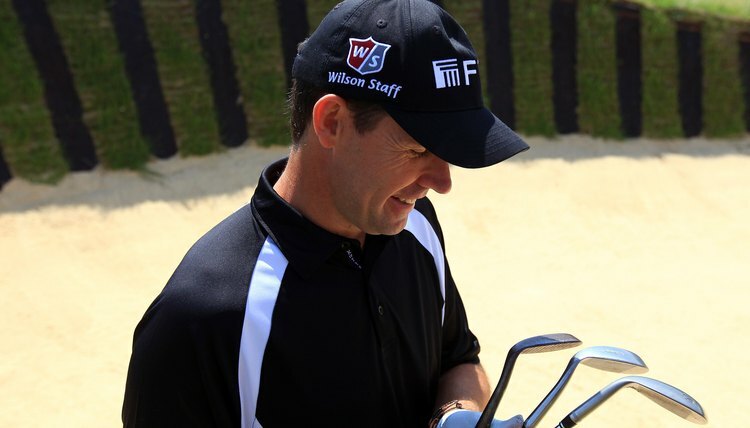 When purchasing a gap wedge, be sure to know the loft of your sand wedge and pitching wedge, as this will help you find the correct loft for your gap wedge. A lob wedge is used for shots around the green that require golfers to hit the ball high and stop it quickly. Lob wedges are not standard with club sets and can be purchased separately. The wedges are often lofted between 60 and 64 degrees, and throw the ball up high in the air with a full swing. The club can be challenging for novice golfers, because taking a longer swing on short shots requires deft touch, and can sometimes lead to bladed shots.